For those in-between fried chicken days. Ever get a little ambitious shopping in the vegetable aisle and find yourself with produce that has to be used up ASAP? Well, I found some zucchinis and asparagus in my fridge today that needed to be eaten, but didn’t want to go with the old sautée stand-by. Then, I remembered a pasta recipe in Tyler Florence’s new book, Inside the Test Kitchen (which I highly recommend) that was squash-centric and used it as a basis for the dish below. It turned out delicious and the execution was simple! The blended vegetables made a creamy, flavorful sauce that tasted decadent without any added dairy. 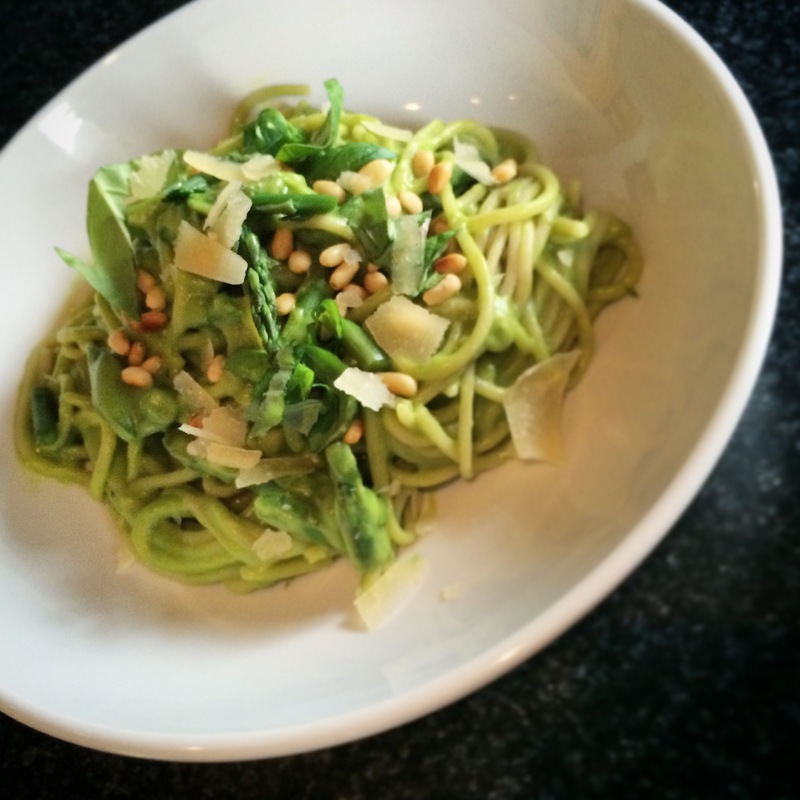 The asparagus and pine nuts added great texture and flavor as did the basil and Parmesan. I used brown rice spaghetti to make it healthier, but feel free to use your favorite brand. This entry was posted in Cooking and tagged Almond meal, brown rice pasta, creamy, fast meal, foodie, original recipe, pasta, recipe, recipes, spaghetti, vegetarian, vegetarian recipe, zucchini on May 12, 2015 by friedchickenanonymous.